Summer mountain activities in Morzine, Les Gets & St Jean d’Aulps. One of the most exciting summer mountain activities. The water gushes off the mountains, down rivers filled with boulders that came crashing down in years gone by. This makes for an exciting ride down on a raft, hot-dog (like a raft but smaller), hydrospeed, bodyboard or kayak. 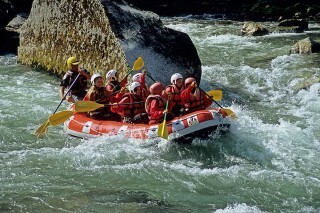 Getting a group together in a raft is a fun way to work as a team with a guide to help you make your way through the rapids. The perfect escape from the summer heat. An incredible summer mountain activity, but not for the faint hearted, or anyone afraid of getting wet! 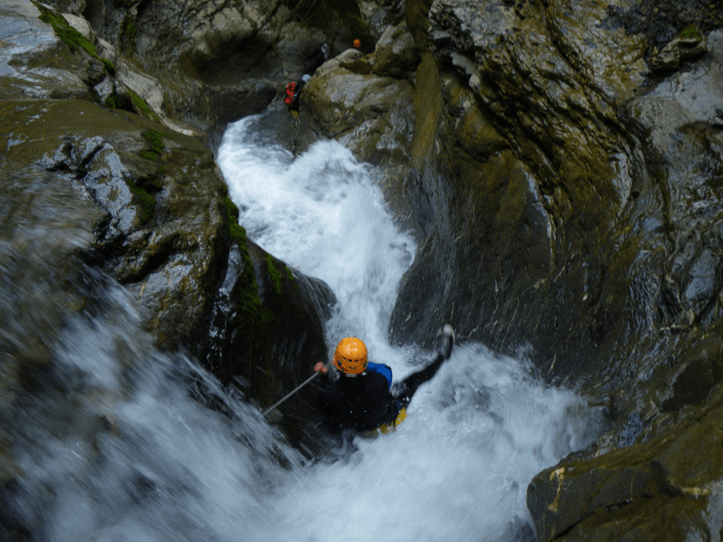 An intrepid adventure that combines caving, scrambling, climbing, jumping, abseiling, sliding and white water for the ultimate adrenaline rush. Get up close and personal with the Dranse river and the Nyon waterfall. 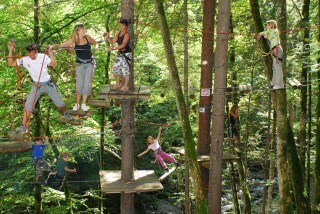 Walk around in the trees, gingerly step your way across wobbly bridges high in the sky, zip through the air at breathtaking speeds…. There’s one in Les Gets near the lac des écoles. In Morzine there are two, the one in the “Parc des Dérêches” is perfect for kids and first timers, while the Nyon one is great for teenagers and adults with a strong head for heights! Ever wondered what it would be like to fly above and alongside the mountains? 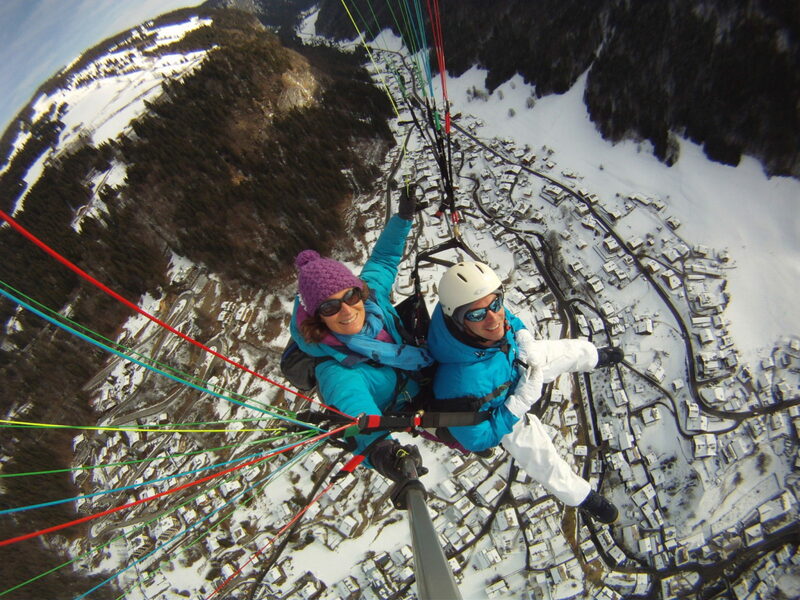 Get a birds eye view on Morzine, Les Gets or St Jean d’Aulps? Book a tandem flight and you’ll find out. Glide peacefully through the air, and your guide can point out places of interest. Finish with a heart stopping fast spiral down towards the ground, before your pilot straightens up and slows down for a smooth landing. 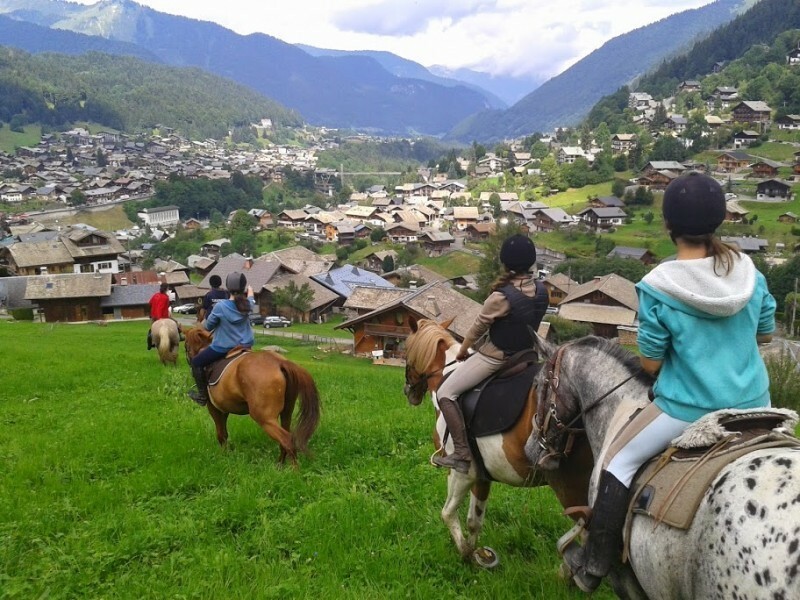 Equestrian centres in Morzine, Les Gets & St Jean d’Aulps have lessons and courses from beginner to progression level; treks to explore the area, and even short pony rides for little ones. The antidote to all this adrenalin! Sometimes all this sport can take a toll on your body. Luckily there are plenty of spas around to ease aching muscles. You’ll find a sauna and hammam in the main Morzine pool and several hotels have spas that non guests can use. Les Gets has the Sereni Cimes spa with a range of treatments and massages. 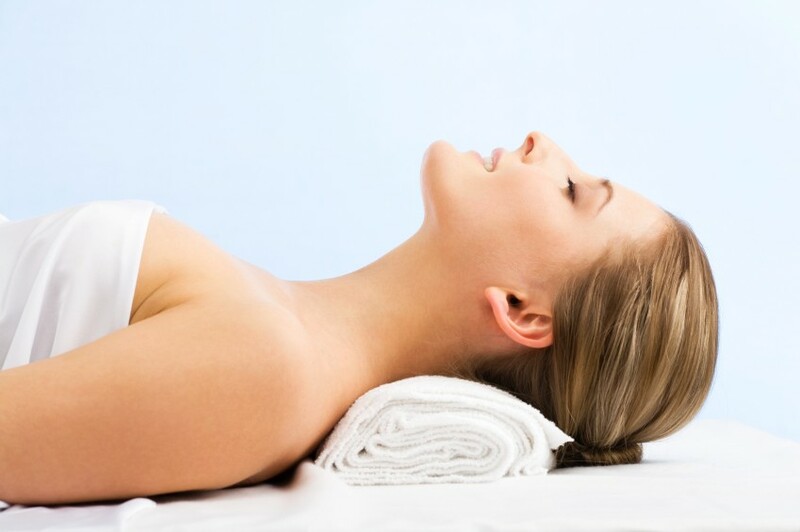 There are even some mobile massage services we can recommend who’ll come to your chalet to massage you, so there’s no schlepping back home after. There’s so much to do we’re having trouble leaving things out! Trampoline: In Les Gets by the base of the Chavannes lift you’ll see some enormous trampolines with harnesses to keep jumpers safe. Petting farms: In Les Gets and in the “Parc des Dérêches” in Morzine, free petting farms with animals for children to get close to. Cinemas: In Morzine and Les Gets, handy for wet weather! Bowling: In Les Gets, handy for wet weather! Disc golf, archery, paintball, yoga, petanque, fishing, local shops & products, cheese makers…. Get in touch to book your active summer mountain holiday.